Enterprises collect large amounts of data and analyze it to obtain a competitive advantage. Some are using machine learning techniques to create predictive applications for fraud detection, demand forecasting, click prediction, and other data-intensive analyses. Recent advancements in machine learning make it possible to go even further, bringing deep learning within reach of developers everywhere. Now, computer vision, speech recognition, natural language processing, and audio recognition applications are being developed to give enterprises a competitive advantage. Processing large amounts of data for deep learning requires large amounts of computational power. As new tools designed specifically for deep learning become available, developers are using them to build their applications on advanced clusters that take advantage of accelerators such as NVIDIA GPUs. When organizational advantage is tied to the insights achieved via deep learning, the underlying IT infrastructure needs to be deployed and managed as enterprise-grade, not as a lab experiment. However, building and managing an advanced cluster, installing the software that satisfies all of the library dependencies, and making it all work together can be an enormous challenge. 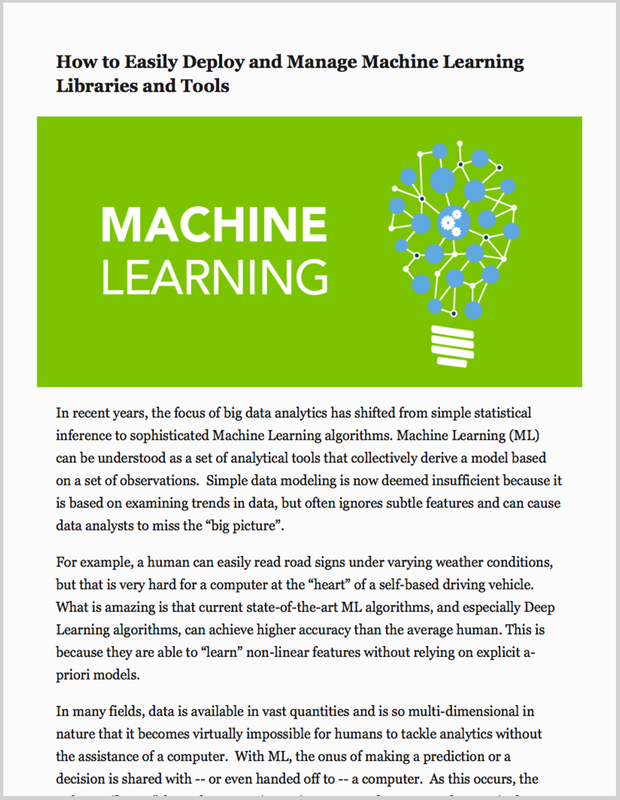 "Many Fortune 500 and Forbes 2000 firms will need to apply deep learning to their big data workflows. Enterprises that do this ahead of their competitors stand to gain a major competitive advantage." 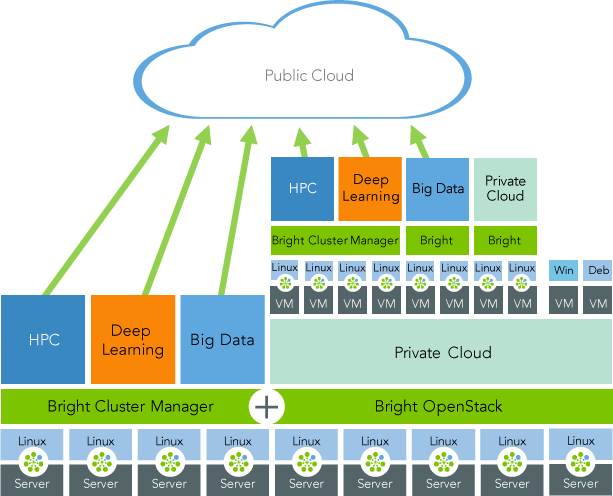 Bright provides everything needed to spin up an effective deep learning environment, and manage it effectively. Bright Cluster Manager provides a choice of machine learning frameworks, including Caffe, Torch, Tensorflow, and Theano, to simplify your deep learning projects. Bright includes a selection of the most popular Machine Learning libraries to help you access datasets. These include MLPython, NVIDIA CUDA Deep Neural Network library (cuDNN), Deep Learning GPU Training System (DIGITS), and CaffeOnSpark (a Spark package for deep learning). 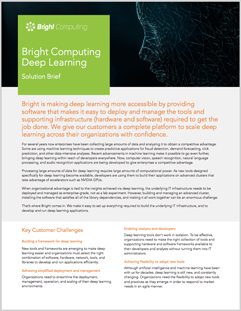 With Bright, you don’t have to worry about finding, configuring, and deploying all of the dependent pieces needed to run those deep learning libraries and frameworks. We include over 400MB of Python modules that support the machine learning packages, plus the NVIDIA hardware drivers, CUDA (parallel computing platform API) drivers, CUB (CUDA building blocks), and NCCL (library of standard collective communication routines). The world of deep is very fast paced and it's our objective to make the set of tools we provide as up to date as possible. The following is a list of supported modules and versions supported in Bright Cluster Manager for Data Science as of June 2018. Why pay for a second monitoring solution when you can use Bright? Automating tasks with Ansible on Bright Cluster Manager head nodes and software images. Want to see Bright Cluster Manager for Data Science in action? 2009–2019 Bright Computing, Inc. All rights reserved.